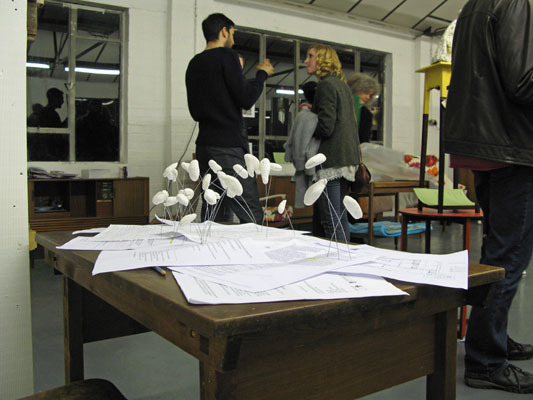 On Saturday 19th November 2011, six Remarkable and Curious Conversations artists had work installed as visiting artists in The Re...Show, an exhibition curated by Rekha Sameer in the furniture showroom of Out of the Dark, a project to train disaffected and discouraged young people in furniture restoration skills. 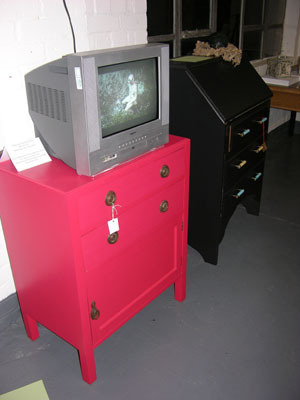 The young people repair and repaint old furniture, creating interesting and attractive one-off pieces. Philip Lee and Cally Trench were among the twelve artists with work in the main exhibition, which took place from 11th November to 25th November 2011, with a performance by Philip and Cally at the private view. 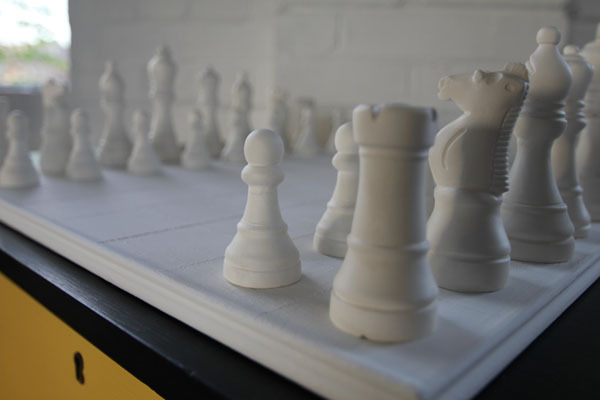 The other artists in the exhibition were were Abi Spendlove, Ben Hodson, Gin Durham, Jamie Bradbury, Josephine Reichert, Katherine Melancon, Kirsten Linning, Pedro Pires, Rekha Sameer and Rory Clark. 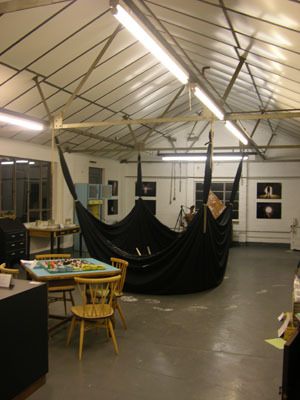 The exhibition received funding from Arts Council England. The visiting artists from Remarkable and Curious Conversations were Imogen Welch, Ingrid Jensen, Pauline Edwards, Linda Francis, Ann Rapstoff, and Carol Coates. The visiting artists' work was installed among the furniture and other works of art. 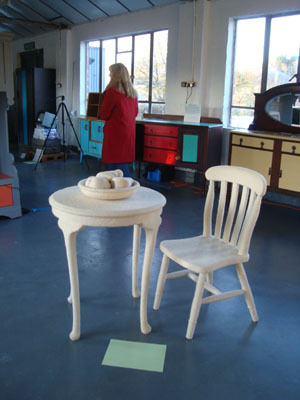 Imogen's work was chosen by her to echo the furniture theme. Ann's photographs of herself in and under the furniture were taken at Out of the Dark a little while earlier. There was an opportunity for everyone to write down a few words or phrases about each work; this formed a starting point for a discussion of each work facilitated by Rekha and Cally. 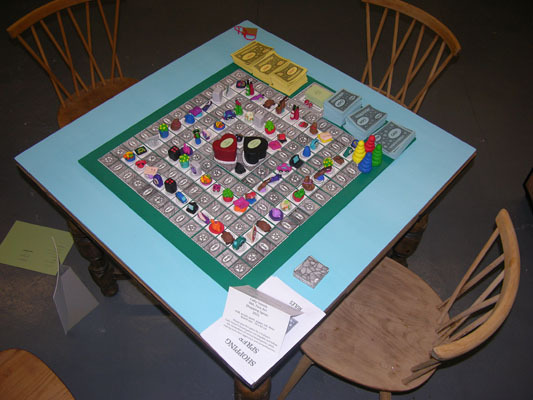 There was then a chance to play Cally's latest board game Shopping Spree, and a discussion with Dave Beech. Philip Lee writes: Everyone installed their work into The Re... Show efficiently, and it was wonderful to see how beautifully it could be integrated into the exhibition. Ann Rapstoff's quirky and enigmatic photographs rewarded close inspection as they lay on the pale blue sideboard. 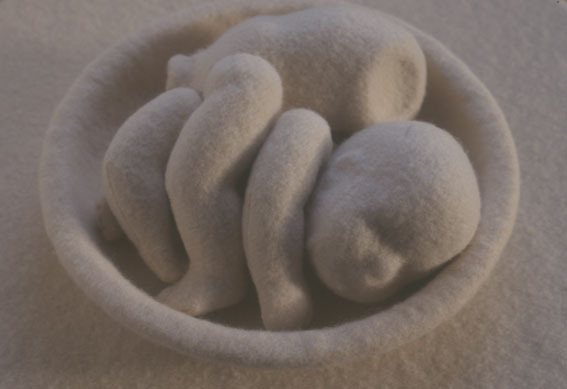 Imogen Welch's cream blanket-covered table, chair and 'fruit bowl' (on closer inspection the 'fruit' were shown, somewhat sinisterly, to be parts of a dismembered doll) chimed brilliantly with the showroom's usual contents. Ingrid Jensen's studio administrator's desk was fascinating, with solid thought-bubbles wobbling at the ends of vertical wires that pierced crucial papers. Pauline Edwards's multi-layered, energetic and colourful painting, nestling in a tall sideboard, was a delight to interpret. 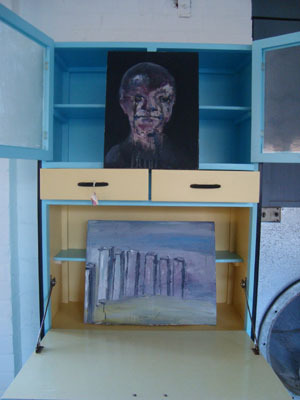 Carol Coates's's two paintings were lodged in a high kitchen unit, their dark themes and muted palette contrasting with the friendly and familiar furniture. 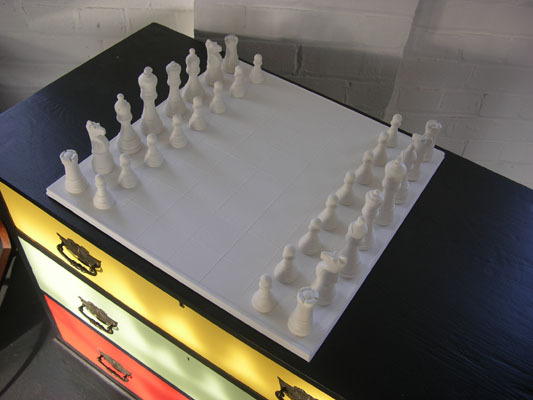 Linda Francis's totally white chess set sat on a multi-coloured chest-of-drawers in the brilliant sunshine, its monochrome appearance defying use and engendering debate about the state of world politics. There was much discussion of all the newly installed work as we toured around the showroom debating each in turn, focused and encouraged by Cally and Rekha. The inspiring day was concluded by a perceptive talk by Dave Beech. Ann Rapstoff writes: My work is often site and context responsive; I work within the area of performance and socially engaged strategies. For The Re...Show, I showed a series of photographic images. 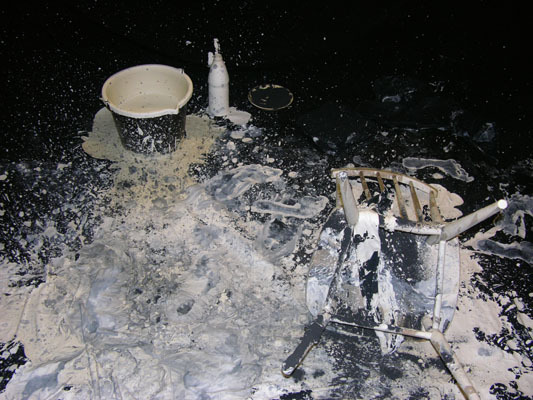 The images document my interactions with the furniture in the Out of the Dark showroom. These illusive images are a reminder of childhood play, of hide and seek and catch me if you can. 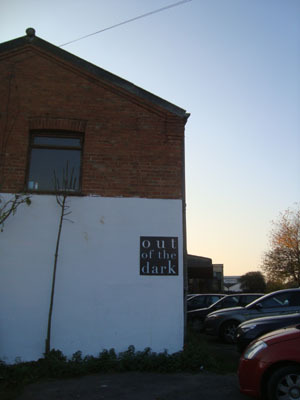 Imogen Welch writes: We made our various ways across High Wycombe to the Out of the Dark showroom to install our work among the existing exhibits. 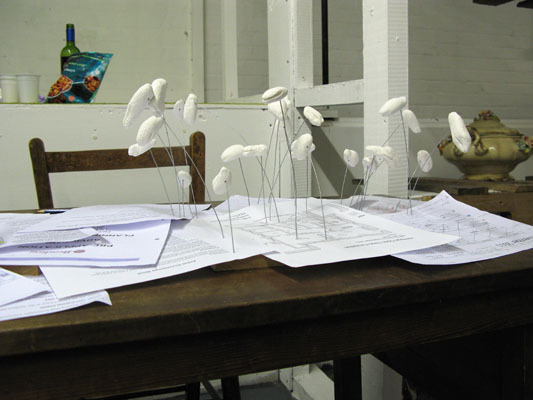 Discussions about the work were very enthusiastic and I appreciate the comments given so generously about my sculpture. Despite the cold we cheerfully played board games made by Cally, and participated in an interesting discussion with Dave Beech. I love the opportunity to have genuine serious conversations with other artists; it doesn't happen enough! 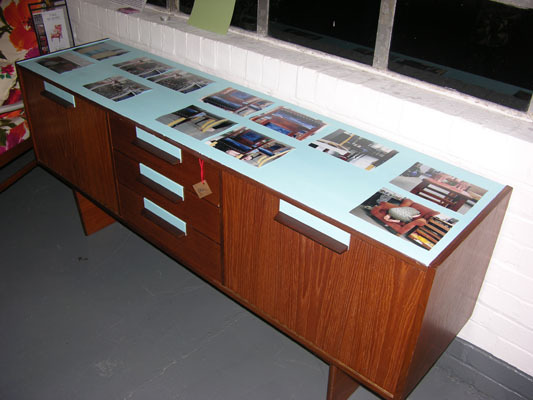 This was an inspiring exhibition integrated into such a wonderful furniture project. 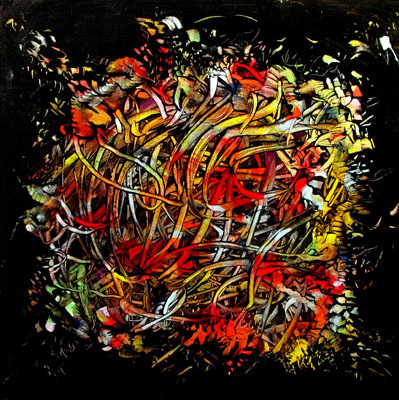 Ingrid Jensen writes: Thank you very much for including me as a visiting artist. It was such a positive experience - partly because of the interesting artists taking part and partly because the Out of the Dark project is so worthwhile and bright. Carol Coates writes: Thank you for the opportunity to take part in Out of the Dark. It was great to take part in such an exciting and innovative exhibition and the opportunity to discuss and share ideas on my own and other's work in a group setting is hugely valuable to me as an artist. Linda Francis writes: An unexpected and interesting venue, blending a worthwhile and adventurous charitable project with an art exhibition that really worked in that environment. It was well curated by Rekha who made interesting contributions to the discussions, and the idea of anonymous comments helped people who would not have otherwise spoken out. A very sociable and constructive day. Pauline Edwards writes: The thing I liked about the exhibition is how our perceptions and understanding of the art was challenged by where and how it was placed within other works.